The Ministry of Health on Nevis launched an awareness campaign, through its Health Promotions Unit, to prevent mosquito breeding and subsequent eradication. The launch took place at a press conference at the Nevis Disaster Management Office (NDMO) at Long Point on March 23, 2016. Deputy Premier of Nevis and Minister of Health Hon. Mark Brantley who officially launched the campaign, welcomed the move. 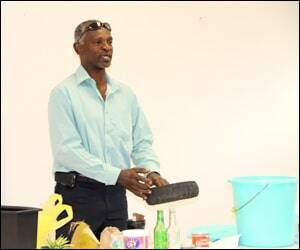 He urged the public to join in the fight against mosquito breeding in Nevis and by extension in St. Kitts. “It isÂ Â my hope that we will get through this particular troubling period without any confirmed cases of Zika but to do that, we need the public on board. We need the public’s assistance. We need the people of Nevis and the people of St. Kitts, by extension, to do the necessary things. “Keep your yard clean. Look out for the mosquitoes and try and prevent them by ensuring there are no open containers where water is settling â€“ these are important initiatives. Cooperate with the health professionals, cooperate with Solid Waste and let us together ensure that Zika doesn’t get a hold here. Let us together ensure that we eliminate breeding today and we keep mosquitoes away,”Â he said. Mr. Brantley assured, that the Nevis Island Administration (NIA) would continue to work closely with the Organization of East Caribbean States (OECS) and the Pan American Health Organization (PAHO). He said they would also continue to follow the dictates of the World Health Organization (WHO). However, he noted that the issue of the maintenance of good health and the prevention of mosquito borne diseases is ultimately a matter for every citizen and collectively, they could help to prevent an outbreak of Zika. The Health Minister expressed satisfaction with the Ministry of Health’s decision to expand on the concept “Eliminate Breeding Today: Keep Zica Away”Â by leading health organizations to “Eliminate Breeding Today: Keep mosquitoes Away”Â for the local campaign. He said although Zika was the rallying cry which brought about the campaign, it was in the interest of Nevis and the wider country of St. Kitts and Nevis to eliminate mosquitoes and to do everything possible to ensure that mosquitoes are eliminated. Mr. Brantley explained that although the recent effort was in relation to Zika, the Ministry of Health had previous efforts for Chikungunya and Dengue, he believes that there is need for ongoing efforts in relation to mosquitoes. “We need not wait until the world tells us there is a problem with some new strain or virus. We need to just be vigilant as a community and as a country and continue to do our very best to eliminate mosquitoes. “It is something that the children can get involved in, encourage them at primary school age. Let us eliminate mosquitoes. Let us do all that we need to do in order to ensure that we don’t have this outbreak of Zika here,”Â he said. Mr. Brantley also commended departments and agencies who joined the fight against mosquitoes on the island, including the Public Health Department and the Nevis Solid Waste Management Authority. Also present were Dr. Judy Nisbett, Medical Officer of Health on Nevis who spoke on the aims and objectives of the campaign, Dr. Patrick Martin, Chief Medical Officer in St. Kitts and Nevis who addressed the clinical aspects of Zika, Mr. Andrew Hendrickson General Manager of the Nevis Solid Waste Management Authority spoke on the Authority’s role in the fight against mosquitoes on the island and Nadine Carty-Caines of the Health Promotions Unit spoke on the matter of risk communication and raising public awareness. Health Educator ShevanÃƒÂ©e Nisbett made a presentation on the communication material and public service announcements being used in the Campaign. Port Health Officer Anthony Webbe in the Environmental Health Department demonstrated a number of vector control measures and Jermaine Lake, Deputy Principal Environmental Health Officer in St. Kitts made a presentation on source reduction.